I’m guilty. Bill Dance is guilty, too. Hank Parker is guilty and for that matter so are the majority of other fishing TV show hosts. We all know better, yet we still find ourselves doing it over and over again, and there appears to be no end in sight; most of us will not change our evil ways. We all started innocently enough, but now we’re pretty much all guilty. No alibi, simply guilty. What are we all so guilty of, you ask? Neglecting a huge portion of this great country’s anglers. Most of us got into fishing for a living by sharing whatever knowledge we’d managed to glean over decades of “fun fishing”, and figuring out that we could smile at a camera, talk somewhat intelligently, and fish at the same time. Well, we can all still do that, but we’ve lost touch with one major thing when it get’s back to the sharing of knowledge; most of you don’t have a boat. When was the last time you saw a fishin’ show filmed on the bank? I’d bet my favorite jerkbait that, if you have seen one anytime recently, it was on a river where boating was not an option. If a drift boat was an option for the host, they would have utilized it. Like I said, no excuses, but I can explain that it is easier to film a TV show out of a boat. It comes down to the fact that all our gear, fishing and filming oriented, is literally along for the ride. We can access more water to avoid other anglers appearing on film without their consent, we can change filming angles to avoid poor lighting, and the show generally ends up more dynamic because the scenery constantly changes. Fair enough. But what about the knowledge we share? Is what we attempt to communicate from the deck of the boat applicable to the far more common scenario of bank fishing? In a word, yes. Fish are fish, presentations are presentations and besides, most of the popular fish species live somewhere near the bank anyway. Furthermore, a well-rounded angler will for sure apply the same fundamentals regardless of whether they’re on the boat or the bank. Having said that, there are a few things I change when I leave the comfort of the boat to fish, and there are also a few things that I definitely do not change. Boats make life easy on tackle. By that I mean my equipment is safer from damage and abuse. For this reason, one of the things I do is step my tackle down a bit in cost. My best rods and reels stay in the boat. St Croix makes rods in a wide range of prices; I choose the less expensive models for bank fishing because I may end up tromping through the bushes, laying them on the rip-rap, etc. So I carry rods from the Triumph, Premier, or Trout and Panfish series. Same with reels, which may end up laying in the sand or water. I choose something along the lines of an Abu Garcia Elite, Silver or Black Max. Very high end equipment is pure joy to fish with, but worrisome to carry on the banks of a river or pond. Along the same lines, my bank lure selection is void of anything rare or real expensive. Snagged lures are usually easy to recover in the boat, but not so much from the bank. I also significantly narrow my overall lure choices which works out fine because bank fishing typically involves less water to consider over a given day. It’s safe to say that, as an overriding concept, I keep my entire plan more simple and less expensive when fishing from land. 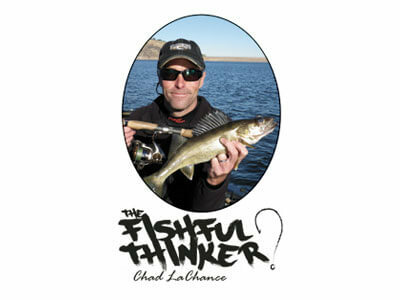 What does not change is my approach to locating or catching fish. I still believe in accurate casting and line control, line watching for bite detection, and the same principles of lure selection. To that end, my abbreviated lure selection is well thought out according to my matrix-style plan of small/medium/large, light/medium/dark/shiny, floating/suspending/sinking, and vertical/horizontal. I also fish the same style of spots or areas. Inlets, outlets, bridges, dams, and boat ramps are always good spots to try, so fish them from the bank. Happily, most of the time these areas are easily accessible from the truck too. I still really focus on transitions in the bank or bottom, edges, weed lines, isolated cover, etc. I tend to mix up my casting angles more than in the boat, and I always fish tight to the bank I’m on as well. If it’s legal and available, I like to get on a dock, seawall or something similar and cast back to the bank. Keep in mind that noise or vibration, and especially a headlamp if you’re night fishing, can spook fish so be sneaky, very sneaky! If I plan to harvest fish from the bank, I carry the OtterBox Trooper cooler and ice. It has backpack straps for easy carry. My dinner catch is immediately dispatched and iced to ensure quality eating. Next time you’re watching your favorite fishing show, keep in mind the host has undoubtedly bank fished a bunch. Listen and observe because the majority of the information will apply regardless. That is advice you can take to the bank.